I’m in Salem, Massachusetts. I’m here for Writer Unboxed’s UnCon. I’m cold. Cold is what I wanted when I registered for the conference last summer. Sweater weather. I don’t get nearly enough. Tree in front of the Clipper Ship Inn, Salem, Massachusetts. Leaves there really do change color in the fall. Central Texas used to be cold in winter. I waited for the school bus with a chill wind whipping my bare legs–no slacks for girls past the fifth grade–and bundled up in a hooded coat for recess. I shivered in the back pew when the church door opened and a blast swept in from the North Pole, which was divided from us by nothing but a barbed wire fence. I watched my father stare out the kitchen window at the heavy drizzle; good for the bright green oats covering Uncle Maurice’s little pasture across the street, but bone-chilling to anyone unlucky enough to be outside, it drove farmers inside to fidget until the sky cleared and left just the cold. I scaled College Hill in San Marcos for 8:00 a.m. classes in Old Main, where the thermometer registered temperatures a good ten degrees colder than in my hometown on the Blackland Prairie fifteen miles south. Red leaves at the Clipper Ship Inn. Central Texas used to be cold in winter. Not Minnesota cold, or Kansas cold, or Ohio cold. Some years, the thermometer didn’t get down to freezing. Some years, Christmas Day was crisp and sunny. Still, farmers paid attention to weather forecasts to learn whether they needed to drain tractor radiators. Once in a while, a January ice storm immobilized us. Minnesotans and Kansans and Ohioans who spent months shoveling snow, chuckled when Texas schools and businesses closed for what we considered inclement weather. We knew we didn’t experience serious cold. But when we went to bed in seventy degrees and woke up in the forties, we were cold. A description of winter in Central Texas isn’t complete without a story, so here’s mine. In December of my senior year in college, I was living at home, commuting fifteen miles to the university, when an ice storm hit. It was a minor event, but highway departments sanded bridges and weathermen warned about icy roads. Public schools declared a holiday. But the university didn’t. 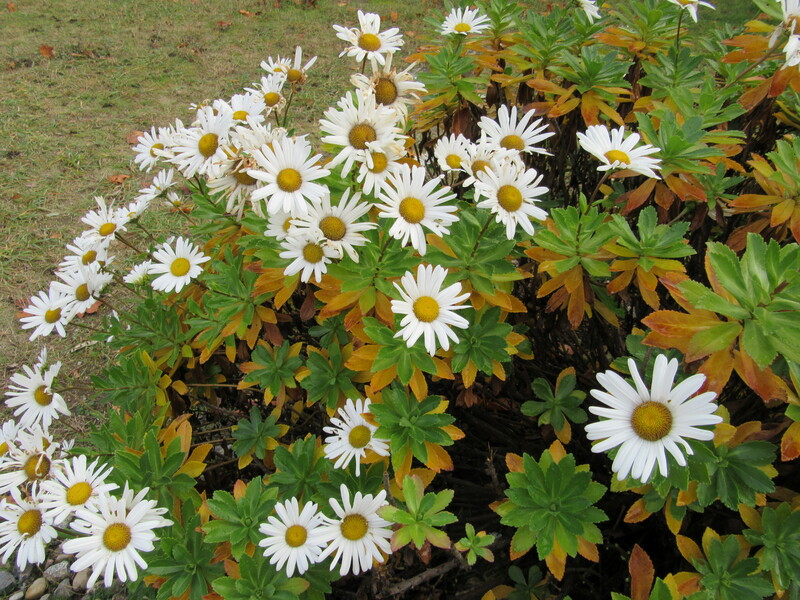 Montauk daisies at the Clipper Ship Inn. “I’ll be fine,” I assured him, then climbed into our 1962 Chevy station wagon, and headed north. About a half-mile up the road, a state highway that carried dozens–hundreds?– of students to college, I hit a patch of ice, spun around, and landed in the ditch facing south. Fortunately, or not, depending on how you looked at it, my father worked right across the highway. Swallowing a large serving of crow, I hiked the quarter-mile down a gravel lane to find him. He saved me from having to confess. We walked together to the car. He drove out of the ditch and took me back home. Firewood at the Clipper Ship Inn. That was a singular year in another way, too. The summer before, my mother had suffered a near-fatal heart attack. While she recovered, my father and I observed an unspoken rule: Don’t Upset Mother. So, trying to appear as innocent as possible, we trooped through the back door and into the kitchen, where she and the cat were breakfasting. “I’m going to drive Kathy to school,” said my father. So much for Upsetting Mother. She was unflappable. He and Mother looked at each other. She explained: “She’s twenty.” He got it. 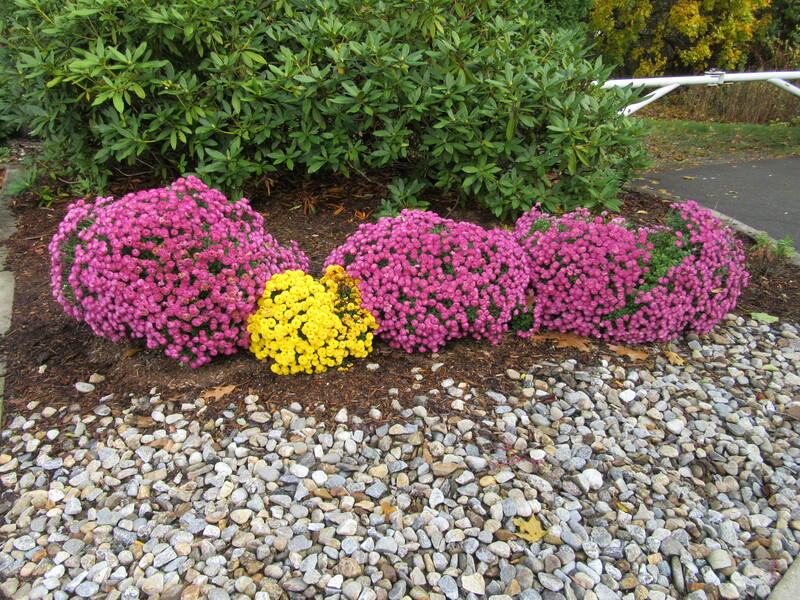 Chrysanthemums at the Clipper Ship Inn. Anyway, he slowly drove me to San Marcos, let me out at the foot of College Hill, said, “Be careful,” and left. I began the second stage of the journey, almost as dangerous as the first–getting up the Hill. I picked my way along, moving from sidewalk to pavement and back, stepping around every patch that looked slick–most were just shiny, but I’d had enough excitement for the day. There was also no one else in sight and, if I fell, no one to pick me up. Caution paid off. I reached the top intact. There another peril awaited: the Quad was a sheet of ice. A deserted sheet of ice. And the science building stood on the other side. I don’t know how I got across. The prospect of going into that comparative anatomy final minus one lecture and one lab practical provided serious motivation. Both tests were rescheduled for the next night, the practical followed immediately by the lecture exam. My father drove me. I didn’t say, “I can drive. I’ll be okay.” I said, “Thank you,” plopped myself into the passenger seat, and let him take the wheel. I might have been twenty, I might have thought fifty was slow, but I was also smart enough to know a good thing when I saw it. Because that fateful morning, while I sat in the station wagon, wondering if I could get the door open, a car packed with college boys–I knew ’em when I saw ’em–flew past, going a lot faster than fifty. If they’d left home a few seconds earlier, they’d have hit my car while it was spinning around. If they’d hit my ice patch, they’d have spun around like I did, but instead of traipsing up the lane to tell my father what a knothead he had for a daughter, I’d have been running to tell him to call an ambulance. So that’s the end of my best winter story. I have a couple of less exciting ones. One Christmas I spent in Houston in the mid-’80s, the water froze in the pipes and the house next door caught fire. The next year, at home, there was a really big snow that ended up measuring twelve inches, packed and iced over. I felt so sorry for the cardinals that landed on the ice, looking for something to eat, that I strewed a whole box of Bran Buds across the back yard, then watched my terrier, Tramp, walk around the yard licking it up. It probably wasn’t appropriate cardinal food anyway. Since the cardinal/Tramp episode, something happened. Summers start earlier, are hotter, and end later. Sweater weather doesn’t come around as often. North Texas sometimes sees snow, but Central Texas is more likely to get some ice in the Hill Country, or to enjoy a thin covering of dirty gray goop we call snow. Weathermen and anchors and school children get all excited, but experienced civilians say, Yeah, right, and go on with life. Winter isn’t as cold now. So last summer–a long, hot summer–when dates for UnCon, a small writing conference held in Salem, Massachusetts, were announced, I filled out the form and sent in my check. I love writing conferences. I love being with other writers, talking about writing, feeling the energy generated when people who share the same interests gather to learn, share, recreate. But I also love cold weather, and Salem in November is cold. So here I sit in the Hawthorne Hotel, near the Witch Museum and the House of the Seven Gables and so many other places I, as a member of POEM (the Professional Organization of English Majors), long to see. Tomorrow I’ll attend classes and seminars designed to teach me how to write. 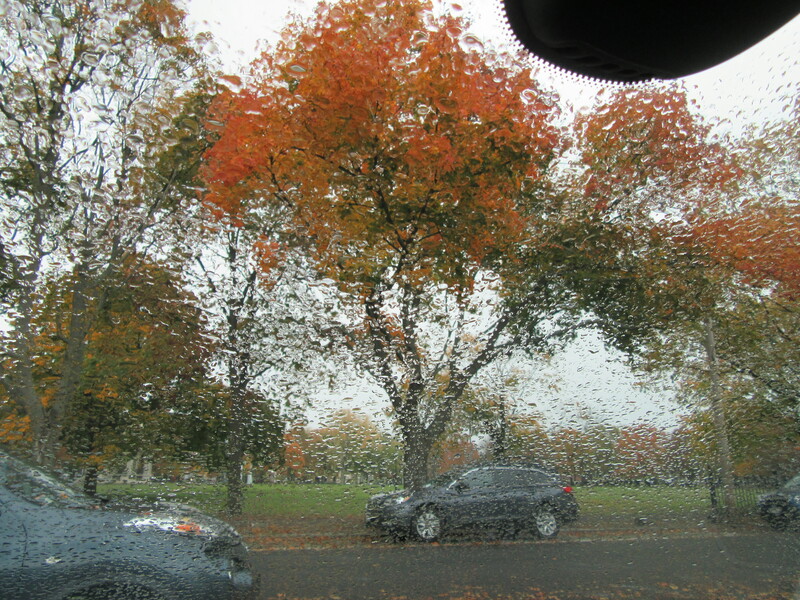 But–and here is my dirty little secret–I came to Salem not for the writing, but for sweater weather. And I got what I wanted. I’ll write more about UnCon later. * I learned today that Texas is the only place where people say fall instead of autumn. *** Not entirely true. I came for the writing. But I’ve promised myself I don’t have to learn anything. MURDER ON WHEELS. She is working on a novel. and also blogs for Austin Mystery Writers. and binge-watching the original Law and Order. but not so often about the husband. she’ll sleep through the morning UnCon sessions. Previous Post Edgar Lee Masters-Poet? It’s sorta sweater weather here in Wyoming, but tomorrow the temp is to be summer-like: nearly 70! We’re having a BEAUTIFUL, LONG AUTUMN with plenty of sun, and I’m LOVING IT! (I take a sweater to work, walk at noon without it, and am glad I have it evening when I get off work!). Enjoy the conference, Kathy! Interesting and fun post!! Well, I did have a vest handy here in Colorado just in case…but it’s not really cold. We called it fall in West Central Illinois when I was growing up. 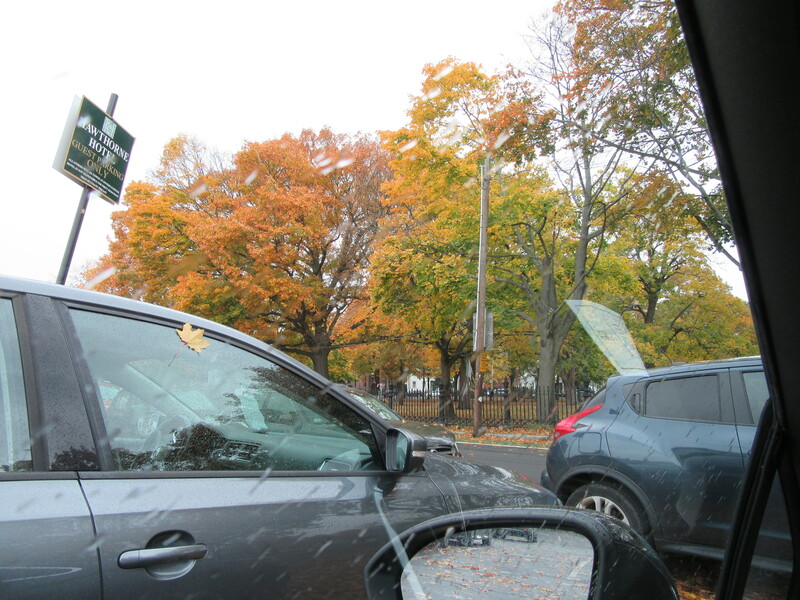 We’d take trips around the area to look at the trees. It was a tradition. POEM, the Professional Organization of English Majors, actually exists? I’ve heard them advertised on A Prairie Home Companion as a gag. Glad you enjoy sweater weather! I do if the alternative is parka weather. Sounds like a fun time and I enjoy conferences too. Usually they are exhausting but always fun to learn and do it with like-minded people. Anxious to hear what you learn. Love this post, Kathy! Especially because I will be heading to Boston for Crime Bake conference this weekend and I was hoping to check out Salem on Sun if my plans for a friend’s visit falls through. And i’m so looking forward to the sweater weather. Hope you’re enjoying your conference! Coastal North Carolina’s winter weather sounds like that Texas weather you wrote about. It can get very icy. Once, a few years ago, I took a 10 p.m. jog down to the mailbox. Didn’t make it all the way. Tumbled on patch of ice and screwed myself up royally. Hurt like the dickens for weeks. I’ve had plenty of sweater weather in my life, growing up in northern Michigan. For some reason, I can’t wait for the first snowfall and the really cold weather that chills you clear through. I love shoveling snow although that’s out now due to my back issues, and cross-country skiing is my favorite winter sport. What joy to ski by yourself in the pristine snow listening to the quiet. Glad you got some sweater weather and hope you enjoyed the writing conference. Here in WV the weather has been a bit crazy. Two days ago I was outside in a long sleeve t shirt. Today I went back inside to grab a coat. We seems to be bouncing back and forth, not much sweater weather here this year. Sweater weather, Kathy? How lovely. 🙂 I rarely have a day here in Scotland when I can remove my sweater. 😉 Scottish weather means a lot of cold, and damp, and ice, and sleet, and maybe even sun all in one day. And plenty of days like that throughout the year. Whatever the conditions, it’s sensible to drive as the weather dictates! I’m glad your ‘wreck’ didn’t put you off driving and that you weren’t hurt. We have horrendous amounts of deaths and bad injuries on our narrow roads which are due to reckless young people who think driving at 70+ miles an hour on bends is possible -but tragically they find that it ‘aint!